TRY BEFORE YOU BUY! with our new DEMO feature! Copy and paste the URL below to begin your demo. - No software downloads needed. - Many items can be edited on your phone or other mobile device. - Edit most text (see below for details- curved text cannot be edited). - Add or remove text as you need and move text anywhere on your invitation. - Text size can be changed. - Move some graphics around. - Add your own images. - Print with OR without backside design (you can delete the backside before downloading). - Download as a high quality PDF's (can also be downloaded as a single JPG). Optional matching backside that can have text or images added. 1. After purchasing the listing, you will receive an email shortly after from Corjl.com with a link to access and edit your file. 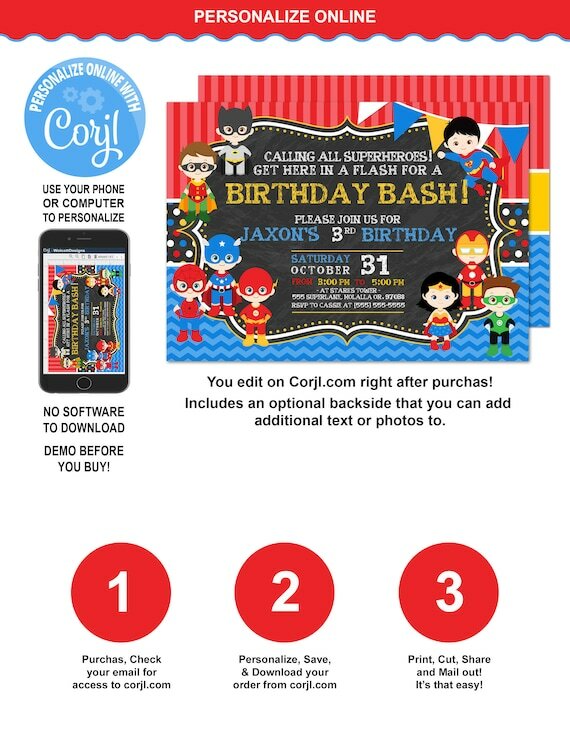 You can also go directly to Corjl.com and enter your Etsy email address and Order number (not transaction number). 3. Download your files and print, email or post it to facebook. - Print on card stock or heavy weight matte paper on your home printer. - Print or at your local print shop, Staples, Office Depot, Kinkos, etc. - You CAN NOT upload PDFs to online printing companies like Shutterfly. - Adobe Reader must be used to view or print the PDF. By purchasing this product you are agreeing to the terms and conditions found on the policies page of our Etsy shop and on the description of this item. PLEASE READ our policies page before purchasing an item or if you have any questions. If you still haven't found your answer feel free to convo or email us cassie [!at] wolcottdesigns.com .